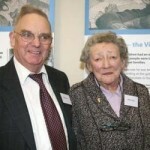 In March 2012 the Staffordshire Archives & Heritage Service celebrated the culmination of 18 months of work on the project, together with Patrick Corfield (Cabinet Member for Culture, Communities and Customers) and Janene Cox (Commissioner for Tourism and the Cultural County). The event, on a beautiful sunny day at the National Memorial Arboretum, was held to launch the project’s book and to say thank you to over 50 of the project’s participants and their partners and friends who travelled from as far as Bournemouth and Margate to attend on the day. There were talks from Councillor Corfield and the Head of Archives and Heritage before Dr. Maggie Andrews spoke about her enlightening research. Copies of the project book were then handed out to those who had been interviewed for the project before the Children on the Move project team were finally given the chance to chat to the participants – some of whom we had only interviewed over the telephone and not yet had the chance to meet in person. 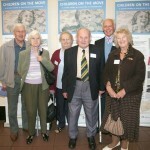 Former evacuees and locals were also reunited on the day. Betty Allen’s father took Peter home so he wouldn’t upset the other evacuees. They remain great friends to this day. 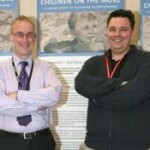 Chris Copp, Senior Museums Officer (left) and Participation and Engagement Officer Matthew Blake. 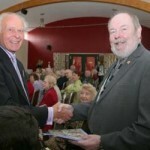 County Councillor Corfield gives Tony Atkinson (formerly Towner) his copy of the project’s book. Tony and his wife travelled from Surrey to be with us on the day. 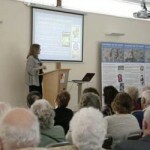 Dr. Maggie Andrews gave a fascinating talk about the history of WWII evacuation in Staffordshire. 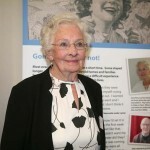 Irene Jones was one of many girls living in Birmingham during WWII who were sent to live at Pipewood Boarding Camp for Girls. Irene Parry was sent hop picking from London before being moved with her family to Newcastle-under-Lyme. She still lives in the area today. 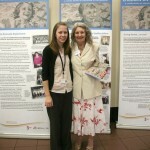 Louise Price, the final Project Officer catches up with Beryl Alderson, who was great friends with Muriel, the evacuee who came to live with her on her family’s Staffordshire farm. 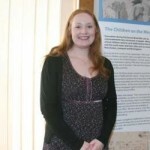 Natalie Taylor, Project Officer for Children on the Move in 2010. Evacuees and locals from the area around Colton were reunited on the day. 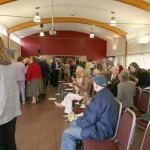 Enjoying the chance to chat to other evacuees and host family members during lunch at the Rose Room. Ernest Chadwick was evacuated from Manchester to Brown Edge. 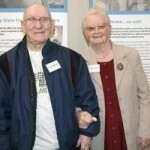 His wife, Dorothy, took in London evacuees in her family home in Werrington. 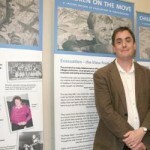 Tom Pine, the first Project Officer for Children on the Move in 2010.